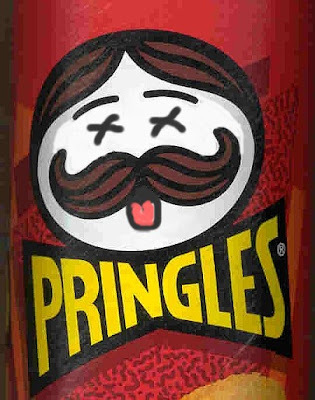 The Drunken Severed Head: Pringle person passes and is packed! Pringle person passes and is packed! "CINCINNATI — The man who designed the Pringles potato crisp packaging system was so proud of his accomplishment that a portion of his ashes has been buried in one of the iconic cans. Fredric J. Baur, of Cincinnati, died May 4 at Vitas Hospice in Cincinnati, his family said. He was 89. Baur's children said they honored his request to bury him in one of the cans by placing part of his cremated remains in a Pringles container in his grave in suburban Springfield Township. The rest of his remains were placed in an urn buried along with the can, with some placed in another urn and given to a grandson, said Baur's daughter, Linda Baur of Diamondhead, Miss." The rest of the news story can be read here. This is not funny... unless the expiry date on the can is the day he died. Bet ya can't eat just one! He cashed in his (potato) chips. Allen and Pierre-- just can it, Guy's. I'm just grateful the guy didn't invent the suppository. didn't mean to ruffle your feathers!